Premium quality, New Zealand produced pure Manuka honey. Watson and Son specialise in the production of premium Manuka honey with innovative products which harness the honey’s antimicrobial properties. Situated in the Wairarapa region of New Zealand, Watson & Son has over fourteen thousand beehives placed in some of the most remote mono-floral Manuka areas of New Zealand. Pure Manuka honey from New Zealand is gaining a reputation around the world for being a natural wonder due to its well documented and unique healing properties. 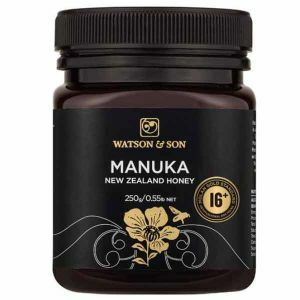 All Watson & Son Manuka honey is harvested by Maori people with great respect for the land. The Maori philosophy of “Kaitiakitanga” promotes guardianship and urges people to tread softly on the Earth. Watson & Son are committed to ensuring the sustainability and long term use of the Manuka “taong” (treasure), and protecting the fragile elements of the NZ ecosystem.